The Center for the Ecology of Infectious Diseases (CEID) is proud to release our first annual report, highlighting our efforts to date, services, mission, and members. 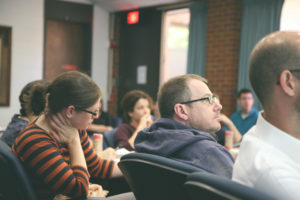 In the year since its establishment, the CEID has developed as catalyst for collaboration in infectious disease research at the University of Georgia. Our core program of seminars, clinics, workshops and other events drew more than 660 participants and we have grown to 55 members across UGA and beyond. The CEID is excited to continue its growth as our disease forecasting, disease mapping, and zoonotic spillover working groups ramp up their efforts in finding solutions to some of today’s most pressing ecological problems, while collaborating to build capacity for member research and providing rising scientists the technical skills necessary to achieve these solutions. FY19 is already looking to be an exciting year for the CEID with a move into dedicated space on campus, shared with the Interdisciplinary Disease Ecology Across Scales graduate training program. This space, located next door from the main Ecology building, will further collaboration among our members, collaborators, and the greater community of infectious disease researchers.